Thanks for the reminder about engagement. I know that is one area I need to improve on. Hope you and Haley meet all your 2017 goals! Thanks, Dawn! I hope you have a wonderful 2017 too and I look forward to jumping over to check out your answers and goals soon. I had to laugh about checking blog stats on your first post! I did the same thing and was so excited that I had more than 1 view even though it was me. Hahahaha. I would love to know how to compress images too! Haha, I’m glad I wasn’t the only one to do that, Jen! Every time I feel like I’m not growing my audience fast enough, I think about that first post and smile.? Love it! Thanks so much for sharing this, Lindsay!? Thanks so much for participating in the Challenge, and for sharing my infringement challenges. I’m excited to see where you and Haley head out in your trailer – if there’s anything I can do to help, let me know! I’m going to be checking back on that photo compression question – I hope someone has the answer, because I’d like to know, too! Thank you for hosting the challenge every year, Amy! I’ve learned so much from all of my fellow bloggers and it really helps create a sense of community. I couldn’t believe what I was reading when I came across your copyright issue. I’m still in shock at the nerve they had to not only steal your content, but then sue you for damages. Unbelievable!? I love how you think about engagement, and it really shows on your blog. It’s getting rarer & rarer to find blogs that feel like they have a form of community support, but yours is exactly like that. I wish I knew about compressing images, that’s an alert that pops up in my tests for my blog as well. If you figure out a good way to do it let me know. I’m glad I’m not the only one that hasn’t figured out how to make Google happy with those darn image sizes, haha! 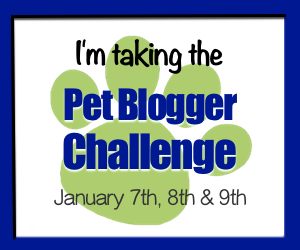 I always learn so much from your answers to the Pet Challenge, so I’ll be heading over soon to check out your post! Great answers, and pretty clever to include that survey. I’m not sure I have your compression answer, but I used a plug in called, “Smush” and even though I resize my photos before uploading them, I do believe the plug in makes them even smaller. As for the engagement, I’ve always had good engagement, but somehow, sponsors seem to overlook that. I’ve heard of Smush and need to play with that again to see if it makes a difference to Google. It sounds like a lot of people struggle with making Google happy with image sizes. I think another blogger mentioned last year that some sponsors were starting to look more at engagement, so I hope that changes. Your voice and posts are so entertaining, I can see why you have so many loyal readers and engagement. Thank you for your post and for sharing your post regarding Apoquel, which I had not yet seen. We have been using it for Bean and not fully knowing it’s positives and negatives has always been on my mind. Hi Bryn! I hope it’s working really well for Bean. We’ve had good luck so far with it for Haley but I really like hearing how other pets are doing on the drug too. We’ll both have to keep our fingers crossed.? Thanks for stopping by and it was great checking out your blog too! A fork! Oh my word, please post a picture of that some day! I always learn from your posts and have bookmarked several of them for future reference. In fact, I even gave you a shout out in my post today. Thanks so much for the shoutout on your blog! 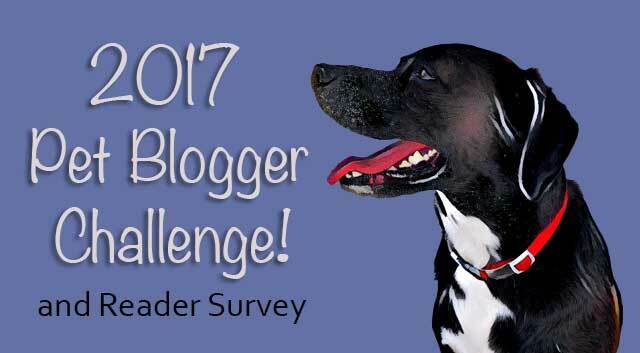 I always learn so much from everyone that participates in the Pet Blogger Challenge and I hope you and Ruby have another fantastic blogging year in 2017!? You do a wonderful job with engagement, Jan! I’m really looking forward to what you have planned for 2017 and maybe we’ll even see that special post.? I’ve been reading your blog for quite some time. I thoroughly enjoy your posts and have learned quite a bit despite Misha being my fourth dog. Good luck for 2017! That’s such a sweet thing for you to say, Melody. I’m humbled and thrilled that you find the posts helpful. I enjoy your blog a lot too and look forward to reading more of your wonderful articles this year. Here’s to a great 2017! I would love to see your dog eating from the fork! Your mention of the post about “Why Does My Dog Greet Me With A Toy?” made me immediately think of my old dog, Hector, who would not only greet me with a toy, but also took it on walks (yes, for the whole walk!). LOL! Oh my gosh, that sounds so adorable! If you happen to have a pic somewhere of Hector on a walk with his toy, I’ll trade you for a pic of Haley eating off a fork, haha! It sounds like Hector had a fun-loving personality. It was great to visit your blog through the challenge and I hope you have an amazing 2017! I may have one! LOL! Love the way you formatted this post in the drop-down boxes! I will be excited to follow along to see where you head out in your trailer! We are starting to travel more and more with our dogs and love every second of it! We use the EWWW image optimizer plugin and have been very happy with it. It does have a small fee associated with it, but it is only $.003 per photo! We usually get a monthly bill of only a couple of dollars. You can also choose between tons of different compression options depending on if and what level of “loss” you are willing to accept. FYI – We have settled on the maximum “lossless” compression and it still reduces our average image size by more than 50%! Thanks so much for sharing the EWWW optimizer. I haven’t heard of it before and have been relying on a program called Breeze Browser. I love the program, but it only works on Windows machines so I have to run it in a virtual machine on my iMac, which is kind of a pain. The price for EWWW sounds very reasonable, so I definitely will be checking that out. Thanks again and wishing you guys a great, golden 2017!? Isn’t it the most fun to have those camping and hiking adventures with a dog? There’s something really special about sharing their outdoor world full of all the great sights and scents? It’s kind of like taking a kid to Disney World, right? Good luck and lots of success in 2017! I hope we’ll see you at Global this year! And I cannot wait to read about your camping adventures. Your blog has really grown and I’ve missed reading it! Good luck in 2017! Hey Shannon! I’m so excited to head your way for the Expo. I was so bummed last year when Haley tore her CCL around that time and we had to stay home and help her with her recovery. I’m looking forward to seeing all the cool products this year and hopefully I’ll see you there too! Wishing you great luck in 2017 too.? So enjoyed reading this post! You do such a great job on your posts and blog! Thanks, JoAnn! I hope we all have a very successful 2017 and I’m looking forward to seeing what’s in store this year for your pack. Maybe we’ll see another litter of those beautiful Chessie pups?? You had some great advice in your post, Kimberly. I definitely have to add the disclaimer soon, so thanks for the tip. Wishing you even more wonderful moments in 2017! Thank you for mentioning my blog. I hope you know how much I respect your blog as well. I try to share the articles often as I know my readers find them very helpful. I took your survey. Keep up the good work in 2017 and Ace says hello to Haley! Aw, you’re very welcome and the shoutout is well deserved. I always appreciate the shares in your emails and everything you do to help fellow bloggers. I feel bad that I haven’t been able to visit as many blogs and comment late last year because of some family health issues, but I’m hoping things will get back on track here in 2017! Wishing you, Ace and Remy all the best this year.? Oh you included a survey!! That was so smart – I love reading about Haley. Will you please do a post about “the fork”? 🙂 Also, compressing images is something I’d like to know about too so I’ll follow that thread. AND I don’t I’ve read your post on Apoquel so I’m going there now — Sherm takes 1/2 tab daily as it’s the only drug that helps him… ugh. Haha! Yes, I’m thinking I might just have to bite the embarrassing bullet and do a “fork” post this year. Haley would love cooperating with the photographer on that one. It seems more and more dogs are taking Apoquel now and I’m glad it’s been helpful. I wish we could do without it too, of course, so I may give the whole raw diet a try soon and see if that helps. Have a great 2017! I did the same thing when I first looked at my stats, but I assumed it was my mom and girlfriend when it was probably just me checking the page 3 times. I usually use Adobe Fireworks to compress my image files, but I’m probably going to start using Photoshop since Adobe stopped supporting Fireworks several years ago. We love Lindsay, Remy, and Ace at ThatMutt too. One of our favorites. All the best to you in 2017! I’m glad I’m not the only one that was checking stats on day one, lol! I use Photoshop for everything but producing and compressing my final output image. I’m still using the old install version (CS6) because I hate the idea of paying a subscription to use the newer versions. I LOVE BreezeBrowser Pro for image management and creating proofs that are compressed with their HQ Style sharpening option (it’s also amazing at converting RAW images) but it’s a Windows only program. Tons of photographers have been begging them for a Mac version, but I don’t think they’re planning on it right now. Sadly, there just doesn’t seem to be anything comparable that can run on the Mac. That survey was great, I took it! Maybe see you at the Global Pet Expo this year! Thanks for taking the survey, Barbara! I’m so glad you’re going to the Pet Expo again this year and I’ll be on the lookout for you! I’m so excited to go this year!! Picture of the fork PLEASE!! 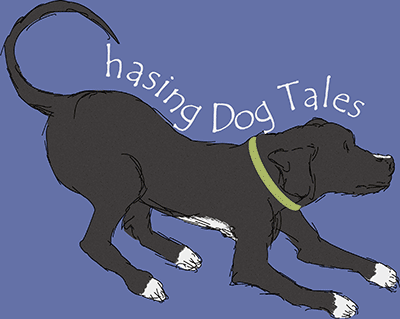 BOL Looking forward to reading about your road tripping! Thanks, Denise! I can’t wait to hit the road this summer with Haley on a big adventure. I’ll have to post a fork pic soon, haha!